26" Knit Fair Isle - Intarsia inspired Christmas Stockings! They are fairly large - long stockings, fit for lots of stocking stuffers. The inside of the stocking is lined to prevent stretching and pulling. Measured Diagonally from the top left hand corner to the toe, the stocking measures 26.5 inches, and the width along the cuff is 6.5 inches. 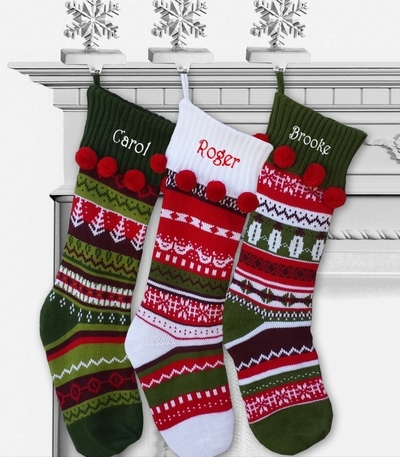 This is a large personalized Christmas stocking that is plenty wide to fit lots of presents. Materials: Wool Acrylic Blend Knit, Lining inside with Polyester Satin. Lining: The Christmas stocking is lined- polyester satin lining prevents the stretching and snags in the knit. We have a sample picture of the stocking monogrammed in different color thread ... click on the thumbnail image in the top right hand corner of this page to see a larger version.